The venerable Rusty Scupper, a fixture at the Inner Harbor since 1982, will be 30 this year. 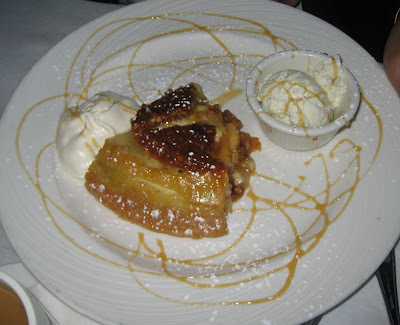 To celebrate the momentous occasion, we were invited to partake in a sampling of their menu classics; I must say I was happy for the opportunity to eat there again. I hadn't set foot in the Scupper since 1998, on a date that would have been forgettable except for one thing: it was then I had my first taste of raw oyster. Let's just say that part was a bit too memorable. When I was younger, my family dined at the Scupper every once in a while, since we all loved seafood and the view was the best around. 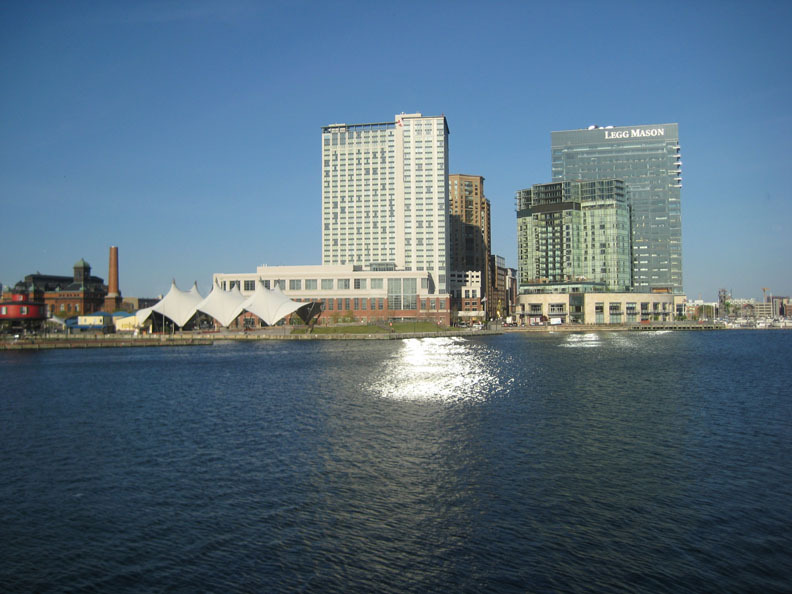 And now that everything at the Inner Harbor has been so built up, the view is even better. I dare say the only better view is probably seen from Tom Clancy's apartment in the Ritz Carlton next door. View of Harbor East from our table. The interior of the restaurant is a lot more elegant than I remember. There are still timbers on the high ceiling, which makes me feel like I'm dining in an ark, but there are also crisp white tablecloths and live piano music in the background. Our recent dinner there would have been quite romantic, except for two things: 1) I was there with my Dad; 2) inelegantly-dressed tourists. Shorts and white table cloths do not match. Food-wise, we were pretty happy. 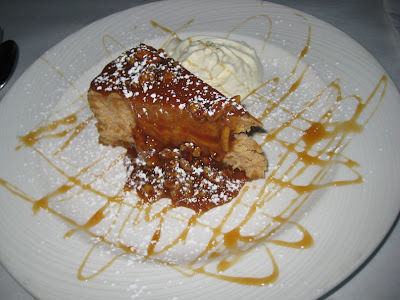 We got to choose selections from a four-course prix fixe menu. 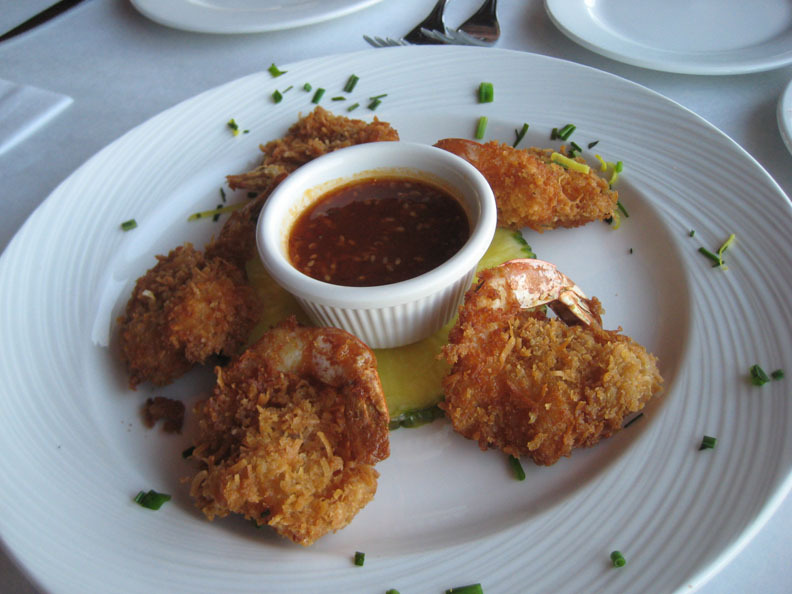 We started off with a shared appetizer of coconut fried shrimp that came with a spicy Chinese-style dipping sauce. Dad loved it, and I thought it was pretty good, too. Then came my favorite course of the evening - soup and salad. I had the chopped salad, which had a generous portion of bacon and a slightly sweet herb vinaigrette. It's the kind of salad that I can consume in large quantities and be very content. Dad's cream of crab soup was lovely - a warm ivory concoction flavored with sherry, containing lumps of crabmeat. One of the best cream of crabs I have eaten in years. So many of them these days are just flavorless wallpaper paste, you know? For our entrées, Dad had the 7oz filet mignon. It was cooked to well (Dad had requested medium-well) but as the steak was so thin, it was probably hard to cook it anything other than medium-rare or well-done. Doesn't matter - it was fork tender and very nicely seasoned, with a nice grilled flavor. I had to try the crab cakes, which were small but meaty, broiled and topped with a mustard butter. 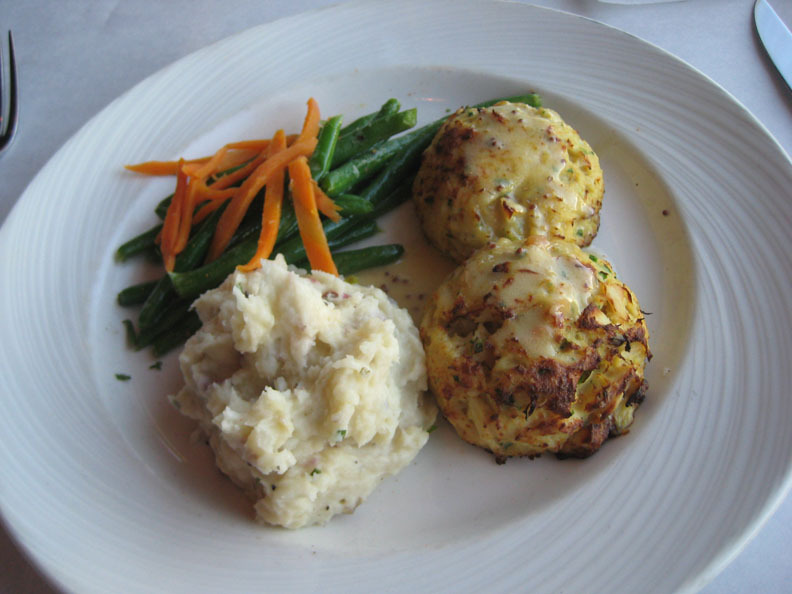 I am a bit of a crab cake snob these days, but I rate the Scupper's crab cakes as being firmly in the top-middle of the pack. 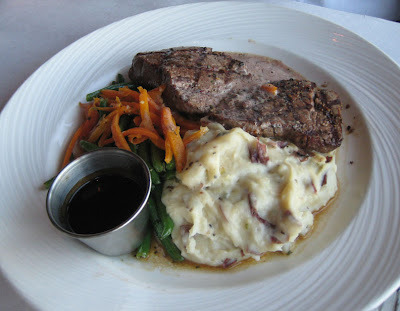 Both entrées came with chunky mashed potatoes and perfectly cooked green beans with thin slices of carrot. For dessert - my second favorite course of the evening - Dad had the upside-down apple pie, which was buttery and fantastic. I had the sweet potato cheesecake, which had a lush, dense texture and combined the best of both sweet potato pie and cheesecake. It was quite evil. Service was professional, yet friendly. Our waitress seemed always to be right there whenever we needed her, but never in the way. We had a good time at the Rusty Scupper, loved the view, and look forward to going again in the future.